These days, you’re never more than six taps away from a photograph of deep green, glossy foliage, artfully filtered and thoughtfully hashtagged. Simply put, there’s a huge trend right now for tropical-look foliage bursting out of every corner of the house, but unless you have a private gardener it can be hard to keep track. 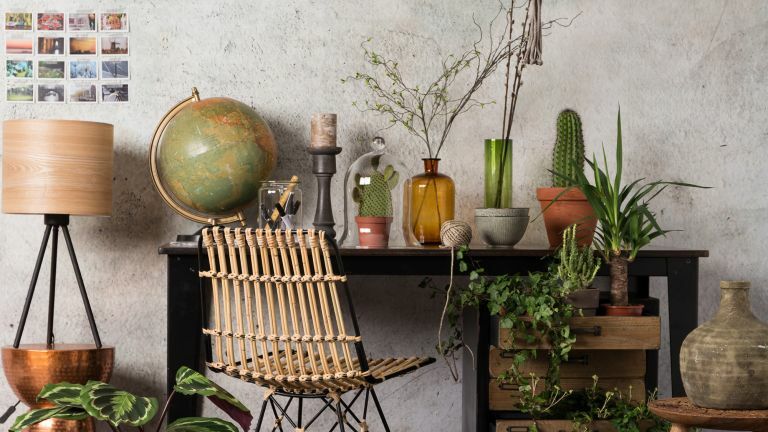 Enter this fabulously Insta-ready artificial rubber tree, with its realistically textured stem, large, lush leaves and on-trend concrete-look pot. Its considerable size makes it a real statement and its evergreen foliage will be abundant year round and – only you and we need know why that is! Run out of available surfaces to accommodate your maximalist decorating tendencies? We hear you. This hanging planter can be hung from the wall or ceiling for an unexpected touch of greenery, and best of all, it’s artificial, so no overzealous watering – inevitably resulting in drips on the carpet – needed. It may not be the most convincing up close, but its delicate strings of variegated faux foliage are unbelievably pretty, and the DIY look of the rope and concrete-look planter is absolutely on-trend. It’s hard to say whether the internet is more obsessed with the monstera deliciosa, below, or super-trendy succulents. Whatever the case, while it’s impossible not to root for both, we think this trio of succulents has the edge for small living rooms and student bedrooms. The mix of leaf shapes and shades of green adds visual interest, as do the elegant copper pots, with their rustic duck egg blue patina. With their shapely pleated leaves and striking white “flowers” (actually a specialised leaf bract – who knew!) peace lilies have long been a favourite go-to houseplant. They’re surprisingly low maintenance, far more tolerant of under watering than overwatering, and happy with ample light or the bare minimum, although those kept in low light will be more foliage- than flower-heavy. It’s also worth keeping in mind that lilies are toxic to cats, so make sure they’re kept in a closed room out of reach of curious kitties. This zebra-like calathea ornata from Trouva is most easily distinguished by its colouring – white to pale pink stripes on the dark green leaf surface with a blush of deep pink underneath – making for a striking addition to any home. The pale concrete planter adds a hint of industrial chic to proceedings, making a pleasing juxtaposition with the vibrant foliage, and like the peace lily, the calathea has great air purifying properties. Simply place it in a reasonably cool area away from fluctuations in temperature, in not-too-bright light, and mist occasionally to keep it happy. As far as houseplants go, they don’t get much more traditional or elegant than a ficus. There’s something about that single trunk and abundance of lush leaves that keep plant fans coming back to them as a staple, and this artificial ficus is easier to look after than most, not least because it won’t go wild and spread the second you turn your back. On very close inspection the individual shoots aren’t the most realistic looking, but the trunk looks very handsome for an artificial, and the variation of leaf colours is a nice touch. Every house inhabited by children – or accident-prone adults – needs an aloe in it, and this Barbados aloe is as good a cultivar as any for its soothing properties on burns, cuts, bruises and scrapes. Unfortunately it’s so lovely that you’ll be loathe to snap bits off to get to the healing gel inside, with its plush green serrated fronds, delicate variegation and serrated shape. If you’re lucky, you may get a tubular yellow-green flower in the summer, but that foliage is lovely enough by itself. Cheekily nicknamed ‘mother-in-law’s tongue’, this sharp-ended plant has gorgeous variegated leaves that would add loads of interest to any shelf or windowsill. As the name suggests, it’s pretty feisty, and almost impossible to kill, so if you’re looking for the best houseplants for beginners, this is a good place to start. It’s also ideal for small spaces, as it doesn’t spread out and is rigid enough not to flop under its own weight as it grows – just be sure not to over-water it, and you’ll be rewarded with a hardy, handsome plant. Low-light lovely with a tropical look? Enter the dragon tree. You might be tempted to inject a little drama into a living room or bedroom with a fierce-looking dragon tree, but not fancy the thought of sticking yourself every time you go to water it. That’s where this slightly softer cultivar comes in: its elongated leaves are a little like an elongated peace lily’s, still striking, but with less spiking. It responds well to low light areas such as hallways, and its “upright habit” (plant person speak for “growing tendency”) means it won’t interrupt your flow as you bustle past. Say cheese! This trendy plant adds Insta-kudos to any space. The Swiss cheese plant (or monstera deliciosa, to be formal) might be among the easier plants to care for, but if you live in a particularly chilly house or don’t have any spots free to give them the gentle sunlight they prefer, this blogger-beloved plant might be more sensible in artificial form. With just enough variation to look natural, but none of the raggedy edges you can sometimes get on a real monstera, it’s a gorgeous-looking and very contemporary addition to any space.